Out in the hay shed at the back of the homestead on Blue Gum farm there is an old cardboard box. This is no ordinary cardboard box. This box is where Penny decided to make her nest and lay her eggs. The hay shed is dark and warm and it is far away from the hustle and bustle of the other farm animals. There are lots of cobwebs hanging from the old timber beams in the ceiling but Penny doesn’t mind. Occasionally there is a cheeky little mouse who runs across the old wooden floor. He has found some stale grain in the corner and he is busily taking some back to his nest between the bales of Lucerne hay to feed his babies. If it was any other time Penny would have chased the mouse and pounced on him and eaten him for her lunch. But not today, she was much too busy looking after her eggs. Once a day Penny leaves her nest to go and have something to eat and a drink from the water trough. She also takes the time to chat quickly with the other chooks to see if there is any news that she has missed while sitting on her eggs. “We saw an old crow trying to steal our eggs yesterday” says Stanny the glossy black chook. “But Walter the rooster chased him away!” squawked Lucy, the old white chook who was losing some of her feathers. “Just as well I chose to make my nest in the hay shed” thought Penny to herself as she hurried back to her eggs. She wouldn’t stay away from them too long because they couldn’t stay warm enough on their own. There they were, just as she had left them. Penny felt relieved. She was always anxious about leaving her eggs by themselves and she was happy to be back to check on them. Penny carefully stepped back onto her nest, without disturbing a single egg. She ruffled her feathers and puffed them all out so that they covered her eggs to keep them warm. 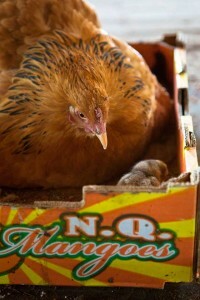 Penny didn’t know what it was but something made her feel very happy when she was sitting there keeping her eggs warm. She didn’t get bored or lonely. She was looking after her eggs and that made her feel very content. 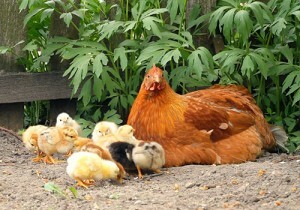 One morning after Penny had been sitting on her eggs for 21 days she woke up and knew that something was different. The Barn was still dark and warm. She could even still hear the mouse going about his business collecting grain to feed his babies. Penny felt excited but very nervous at the same time. Soon Penny felt her nest beneath her shake…… what was happening! 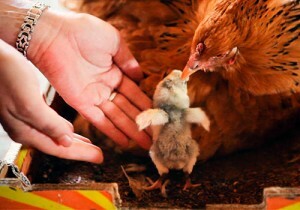 Penny ruffled her feathers to make sure that, whatever it was, didn’t hurt her eggs. Crack!… came a noise from under Penny’s feet. Penny used her beak to nudge the eggs under her to check that they were ok. As Penny did so from out of one of her eggs appeared a tiny, wet, wobbly chick! It’s finally happening thought Penny. My chicks are hatching! As the day went on Penny helped all of her chicks to hatch. She was very exhausted but she didn’t notice because she was so excited that her babies had finally arrived. Later that day, when all of the chicks had hatched and they had time to dry out and learn how to use their legs, Penny left her cardboard box nest in the hay shed. 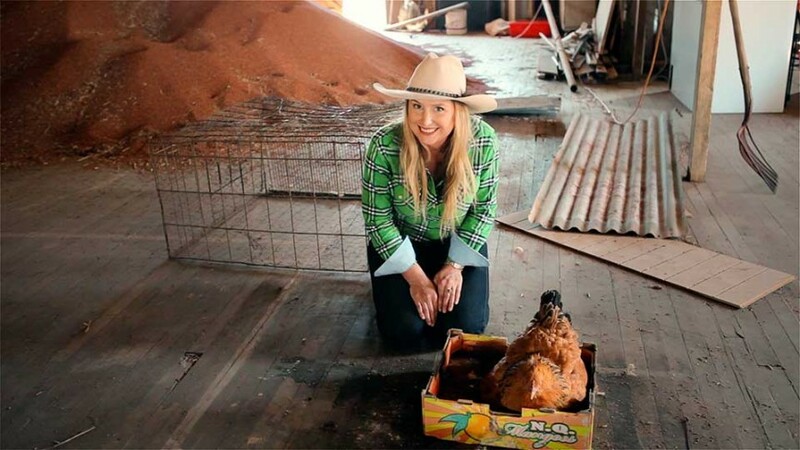 She helped each of her chicks down the old rickety steps at the back of the shed and walked them across the gravel driveway towards the chook house. 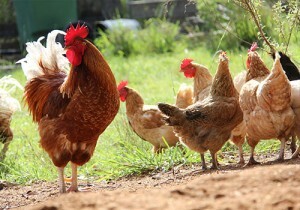 Penny fluffed up her chest and proudly strutted into the chook house with 14 fluffy chicks scurrying in after her. “Oopps Mummy, I just did a poo!”………. But Penny was too proud to notice. She was happy to introduce the newest addition to Blue Gum Farm to her friends.